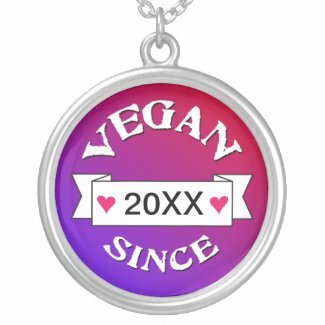 Unique vegan message gifts. 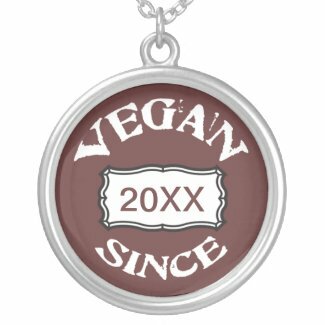 Vegan jewelry and necklaces. Great gifts for vegans who are vegan for creatures great and small. 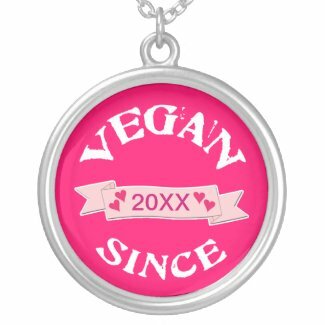 Plus customizable Vegan jewelry pendants allow you to personalize with the year you became Vegan. Vegan since add your date to make a truly memorable and commemorative vegan keepsake gift for yourself or a fellow vegan that represents how long you have been celebrating a compassionate vegan lifestyle.For vegans who want to wear their beliefs on their sleeves, or in this case, ears, wrists and necks, check out this extensive collection of various vegan jewelry, with compassionate, pro-veg messages. How long have you been vegan? 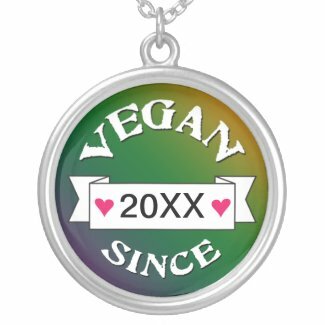 Personalize these vegan necklaces with the year you went vegan. 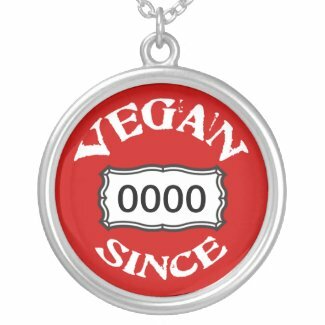 Vegan since necklaces are a great way to commemorate and mark how long you’ve been living a vegan lifestyle. Spread the message of compassionate living with these vegan bracelets. They are vegan-approved and make fun gifts for vegans. Good especially for vegans that talk with their hands. The vegan charm bracelets feature a decorative aluminum charm and bracelet made of brass with electroplated nickel, silver plating, and finished with a non-tarnish overcoat glass. Cute vegan earrings make fun gifts for vegans and if you’re vegan, go ahead and treat yourself! These vegan earrings are made of light aluminum and are circle-shaped with a scallop edge. The earring hook is made of surgical steel. These vegan necklaces feature a circle-shaped pendant that has a fashionable, polished-scallop edge. It measures 1.25″ diameter and since it’s made of silver-looking aluminum, it is light in weight. It comes on an attractive nickel & sliver plated brass chain with non-tarnish overcoat gloss and an easy-to-use clasp.